I thought you might like to see my process, for what it’s worth, and make one yourself if you’re so inclined. 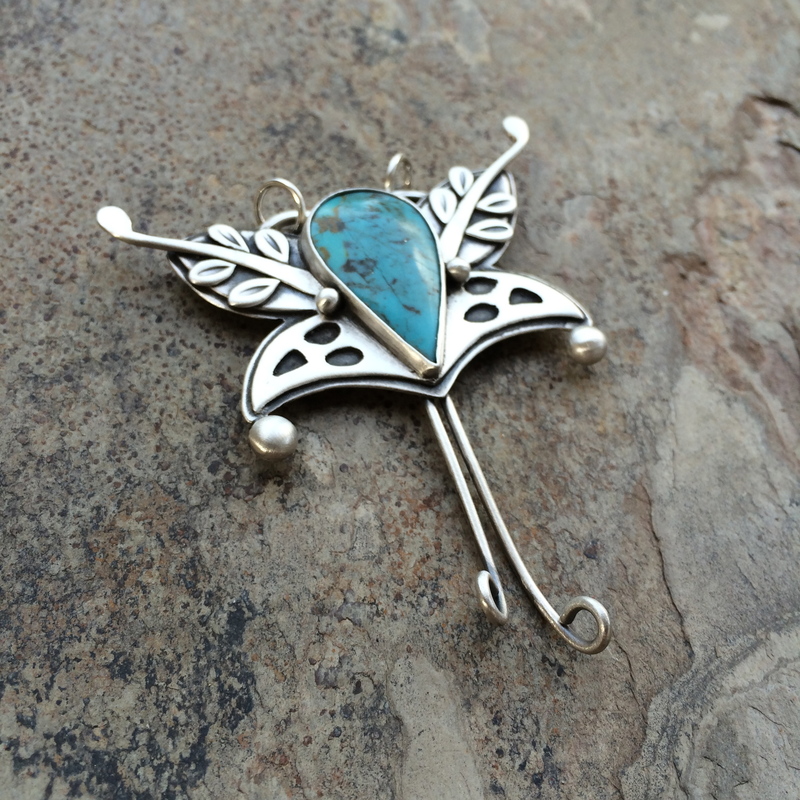 It’s called, The Butterfly Turquoise Flower Thingy. I love to doodle. One day I’ll show you some but for now we’ll just go with this one. 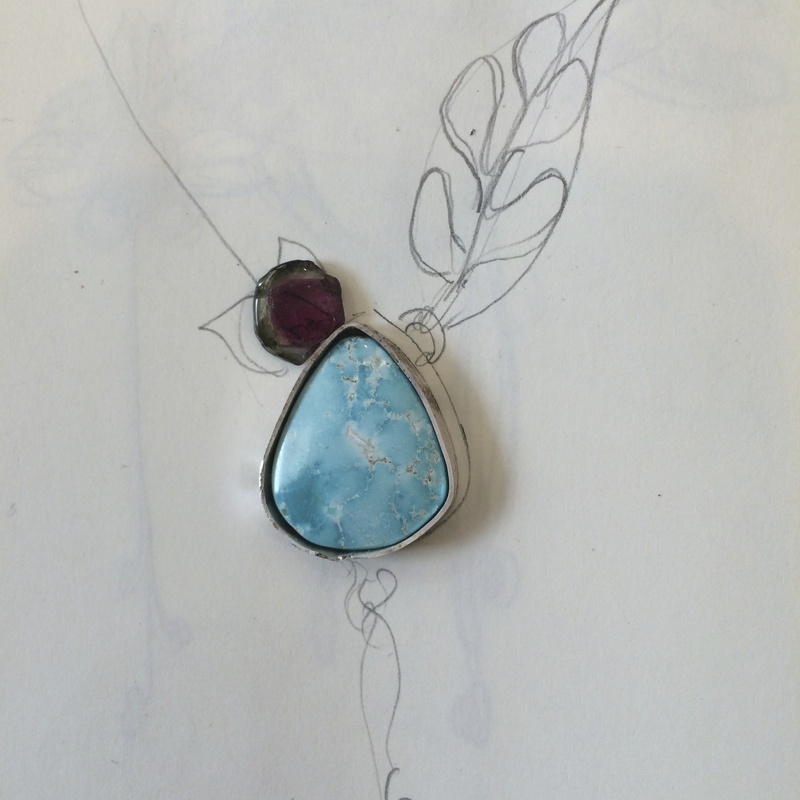 I have a piece of turquoise which I’d already put a collar on because I was going to use it for something else. I can’t remember what happened with that plan, but when I found it just hanging around on my table I decided it needed a new home. So I drove it around the doodle block a few times until we found something it liked. 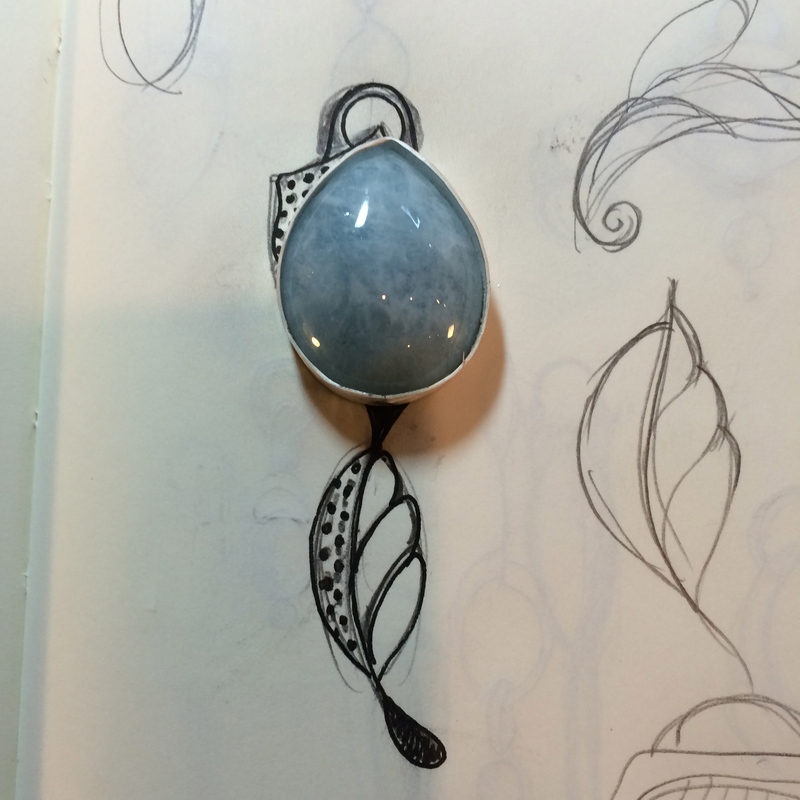 If I find a doodle I like, but which happens to be too small, or large, for the stone I want to use I just re-draw the same design around the stone. This one didn’t really need resizing, but the bottom part of the doodle wasn’t working for me so I kept part of the doodle and just re worked the bottom half. 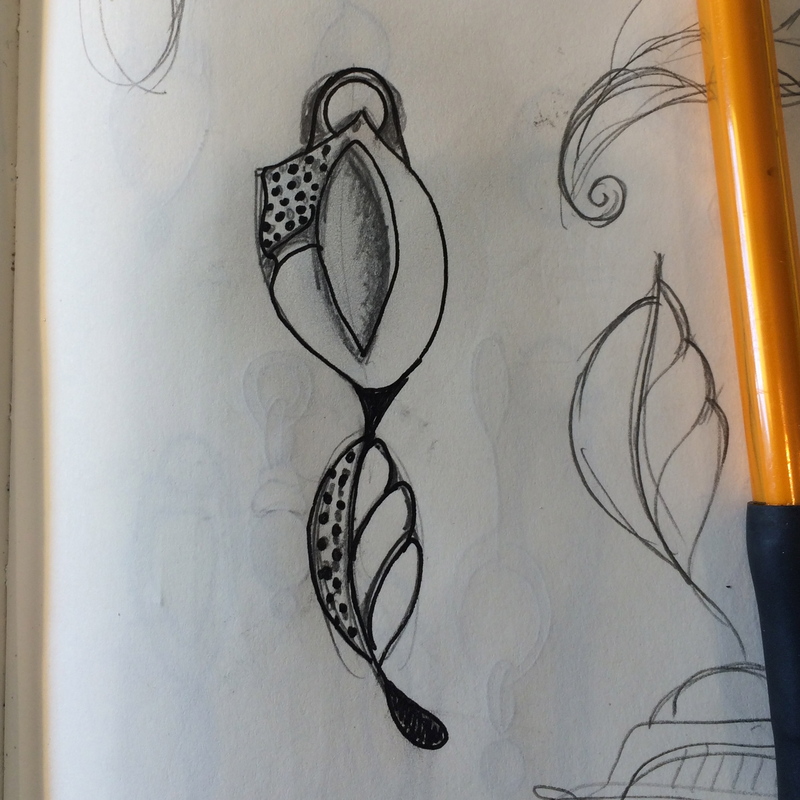 I didn’t really want it to be a butterfly flower thingy, but for some reason my doodles just keep going there. 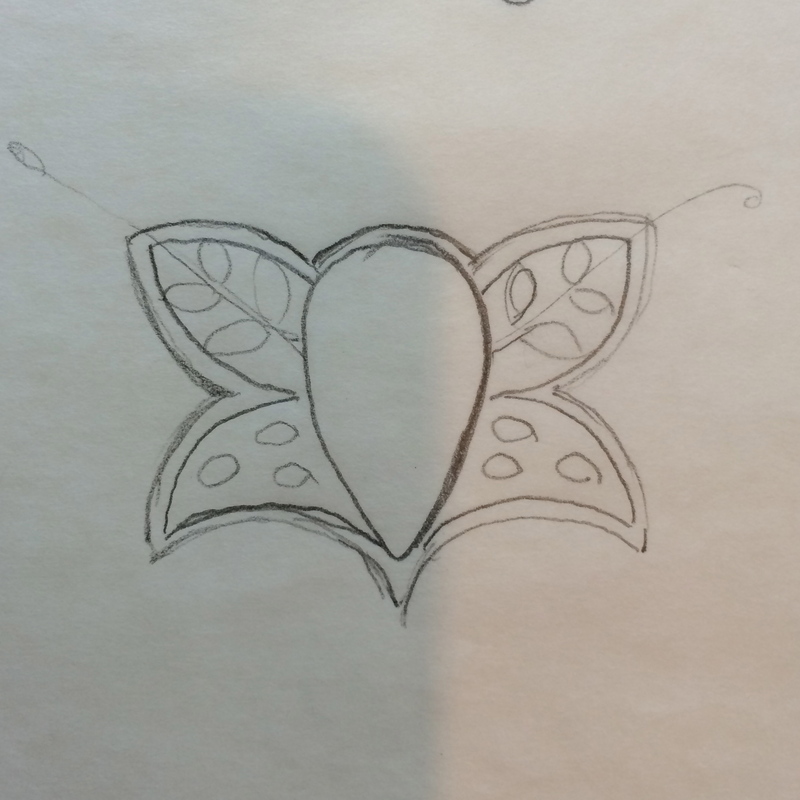 Next I simplified the design and tried to make the shape symmetrical. 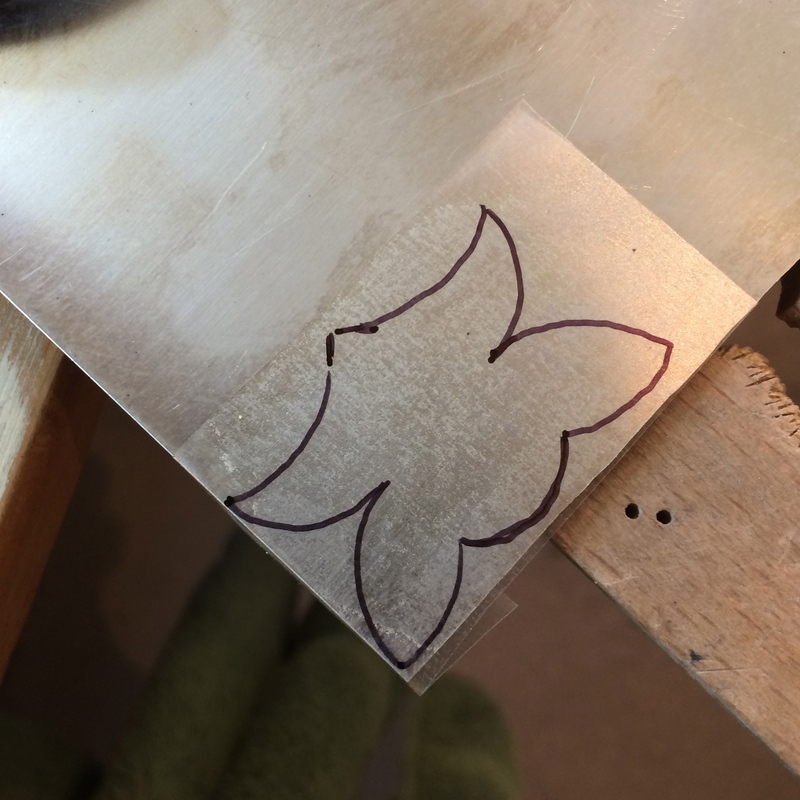 I like to give my designs some depth because a stone just placed on a sheet of silver doesn’t look quite right to me, so I drew an outline around the design which will be a bottom layer of silver. And so now we’re ready to go. and trace what is to be the top layer of the design onto the transparent side of a piece of clear sticky back paper stuff. Some people just tape their drawing onto the silver, or glue it, but I really like using this clear contact paper. You can get it from craft, or office supplies, stores. Once you peel the backing off and stick the film to a sheet of 22 gauge silver you’re ready to saw the shape out. I have left room at the top of the shape because I wanted to have some wiggle room in case the collar didn’t exactly fit as expected. O.K. Perhaps not, but hopefully it will all become clear soon. 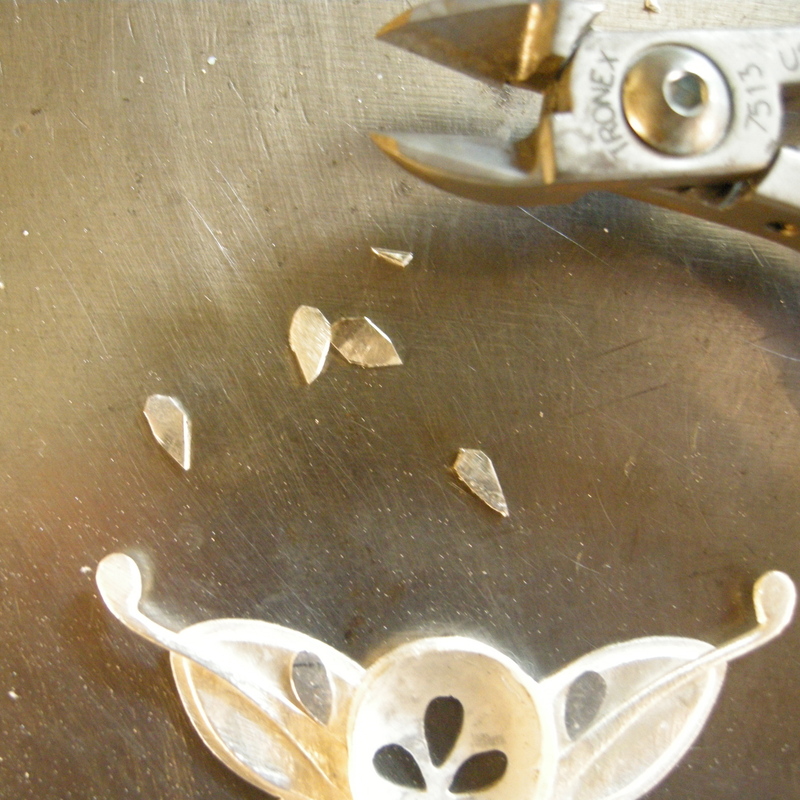 Now, and this bit is very important, peel off the sticky tape from the silver, and all of the scraps. If you don’t do this when you come to solder the silver, or make balls etc., with the left overs, it will burn off and really smell bad and you will breath in fumes and die. Of course I’ve never done this so I’m only guessing. 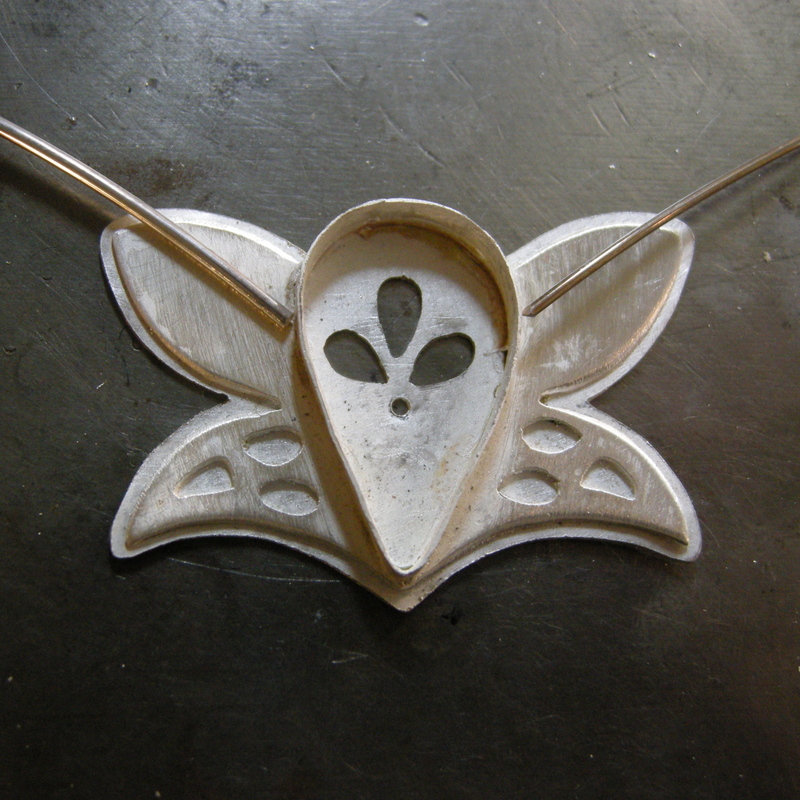 Sand the top of the shape you have just cut out, and also the bottom of the bezel collar. Note: After you have done this re check that the stone still fits into the bezel as you may have distorted the collar when sanding. 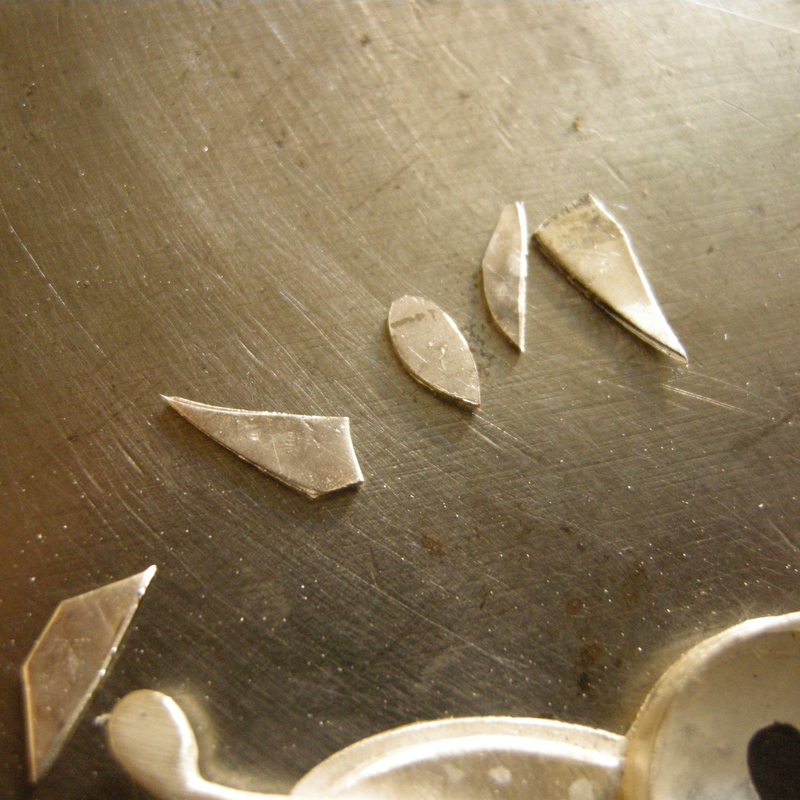 Sand your hard, or medium, solder and cut it into small pieces (pallions), and then you’re ready to solder the two pieces together. 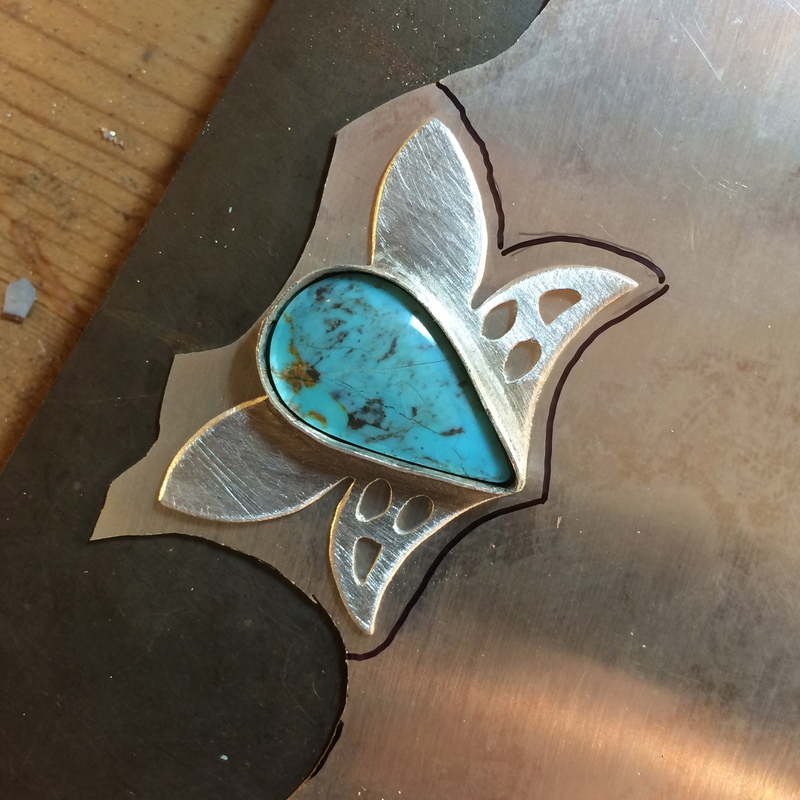 Next, because you want the stone to sit as far down into the silver as it can to give the piece more depth, you are going to cut away the inside of the bezel shape, and the extra silver you left at the top. 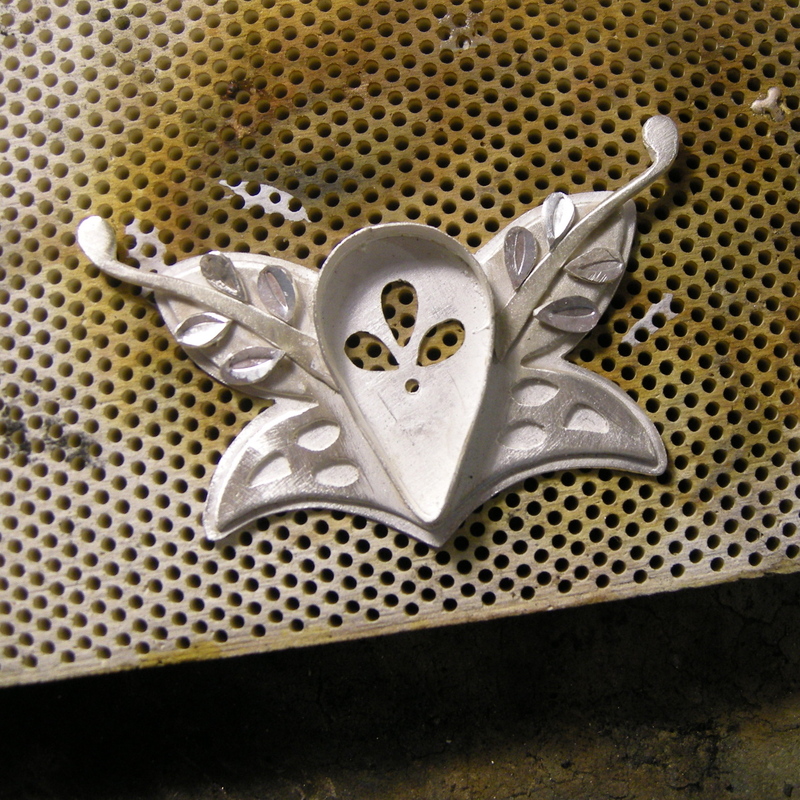 This is easier than trying to match the leaf shape around the bezel. Then you’re going to check to see if the stone still fits. It might take a bit of sanding, but the stone should be able to pass right through the bottom. 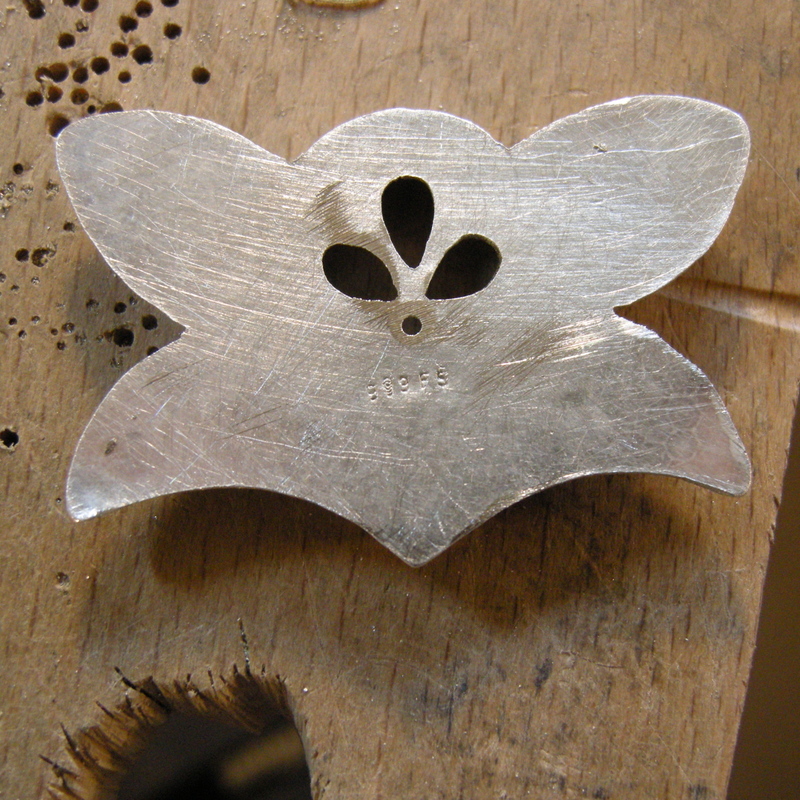 At this point file down the edges of the shape to smooth them and bevel them slightly. 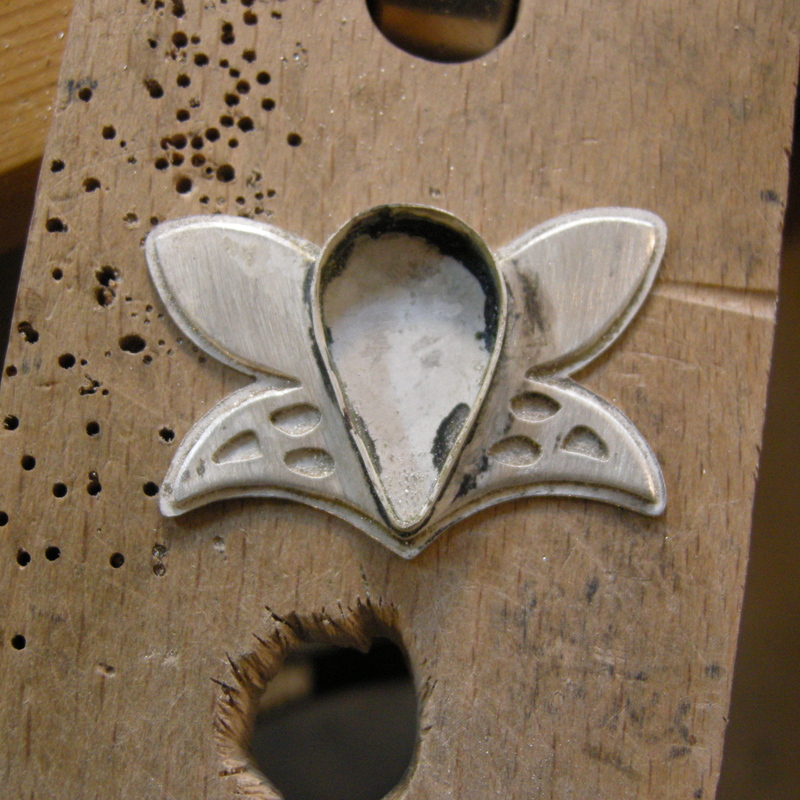 Now cut out the design in the bottom half of the piece. And maybe you think you want to check once more just to see what the piece looks like with the stone and the holes cut into it. But, darn it all if this doesn’t happen just when you least expect it. Remarkably, only the words, oh man, come out of your mouth, and as irritating as this slight set back may seem, you choose to ignore it. 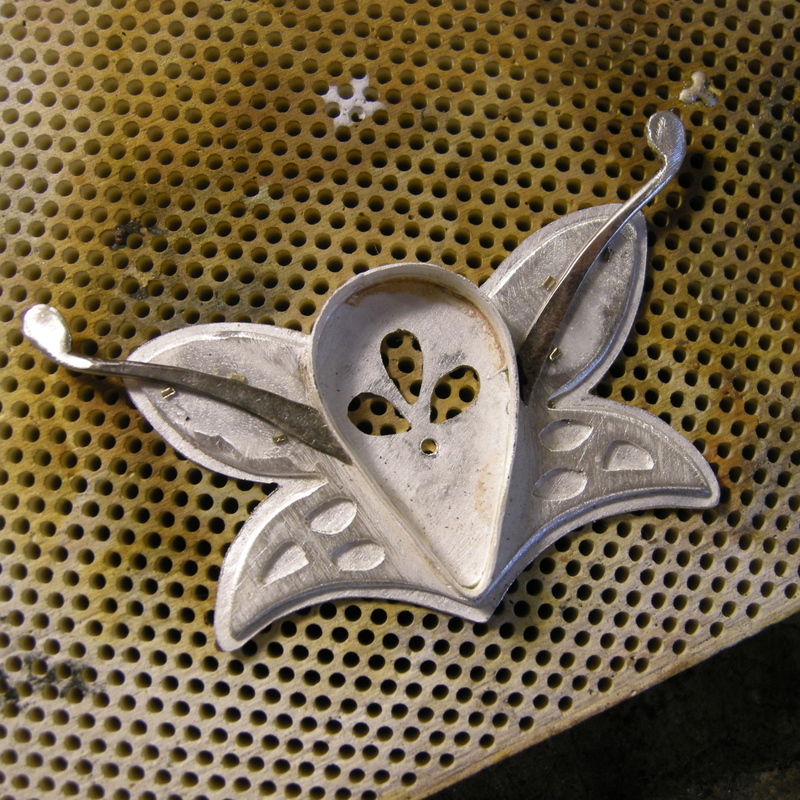 Now cut the rough shape out, clean both touching surfaces, and solder them together. You’re still a bit put out, and the broken turquoise has definitely put a bit of a damper on things just as you was beginning to enjoy yourself, but you plod on and saw away the excess silver. DON’T put the stone back into the bezel until you have either cut out a design on the back, or placed a thread of dental floss etc,. into the recess first. You want to be able to get the stone out again as you continue to work on it. If the back of the stone is nice I like to cut a design into the back of mine. At this point I also stamp the silver mark into it. It’s a little trickier to do it at this point, but I always forget to do it at the beginning. I just prop the inside of the bezel onto a support of some kind, usually my disc cutter stamps, and brace the silver stamp against that. Somehow I managed to stamp it a bit wonky here. Makes it look more professional though, don’t you think? Now I pickle the piece. 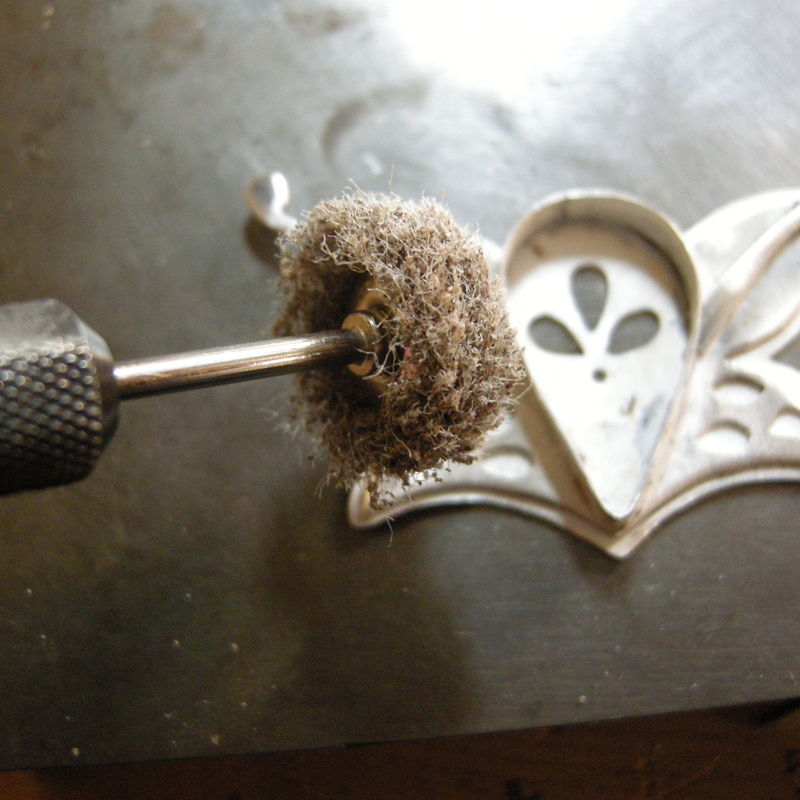 I don’t really like to use the pickle that much and tend to clean where I want to solder by sanding the pieces. The pickle gives off fumes, and will kill you. Yep. Also I get too impatient waiting for it to do its thing. And when I get impatient this happens, and I can’t keep up. 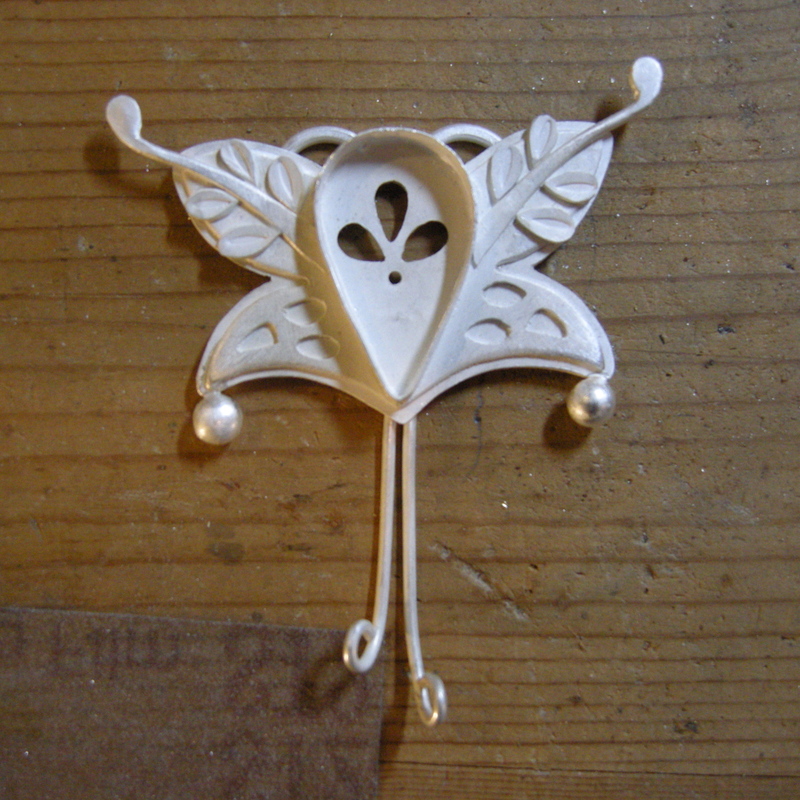 So quickly get the piece out of the pickle before you come up with more ideas than you can cope with, and decide if you want to use 16 or 18 gauge wire for the leaf stems. Really you want to use 17 gauge, but Rio doesn’t have any :( so you go with 16. Loop the ends of the wire, and gently heat it. 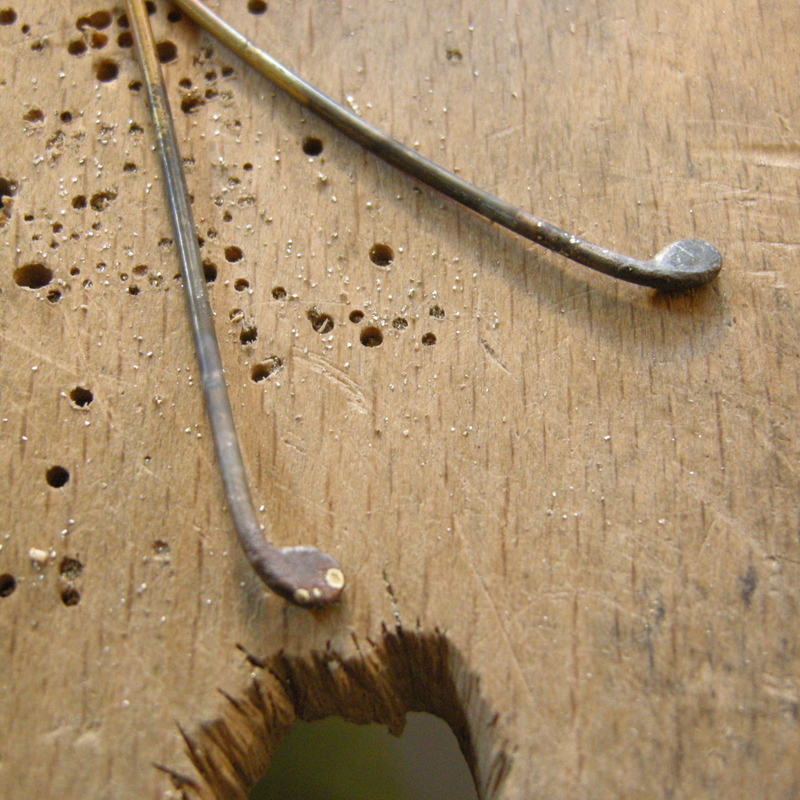 If you do this slowly, and gently feather the flame across the loop, the gaps in the loop will fill in with silver and leave you with this golf club shaped end. For this piece I prefer these to the simple balled ends. You can hammer the ends a little to really define the shape at this point, and sand them smooth. Then decide if you want the club ends to face up, or down. I chose up because down looks a bit depressing – and evil. 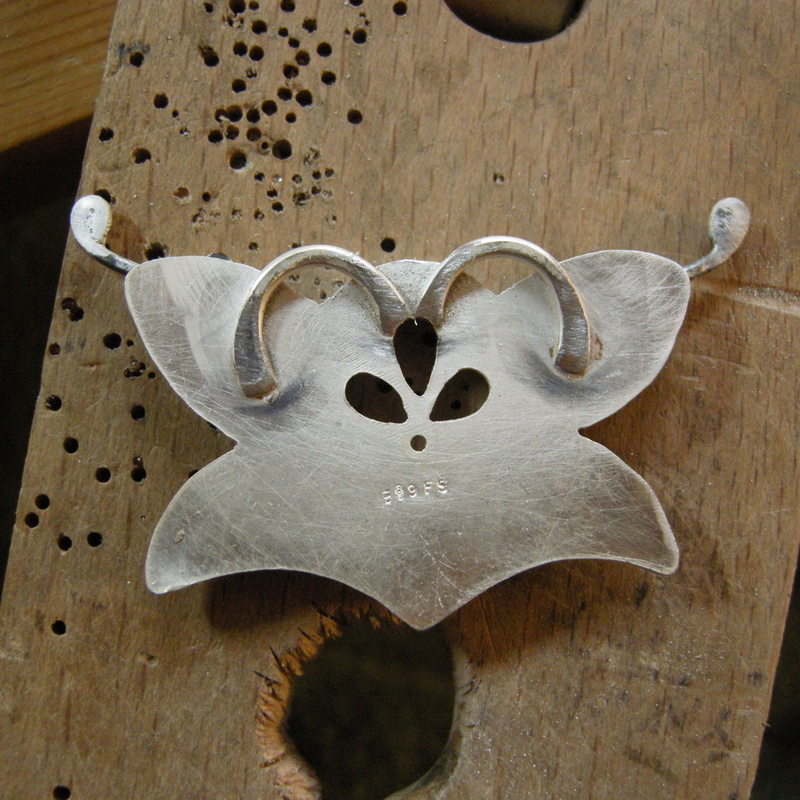 Shape the prongs a little and cut them to the length you want. 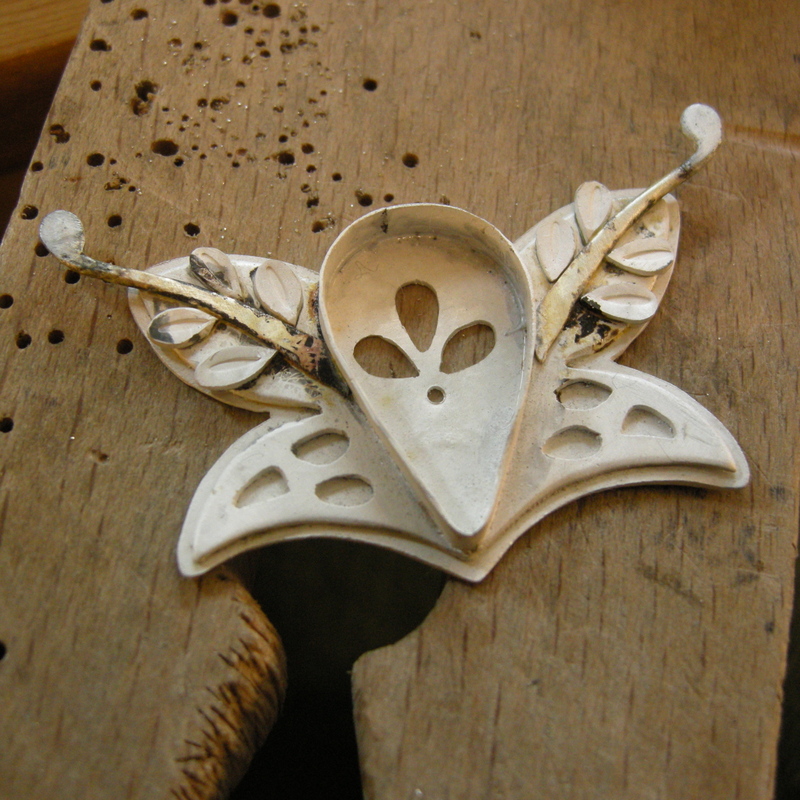 Hammer the ends of the stems closest to the bezel to flatten out the stems and make them look fatter and more natural, then sand them smooth. And, even though prongs up makes the piece look a little crouching tiger, jumping dragon- ish go with it anyway and solder them on. 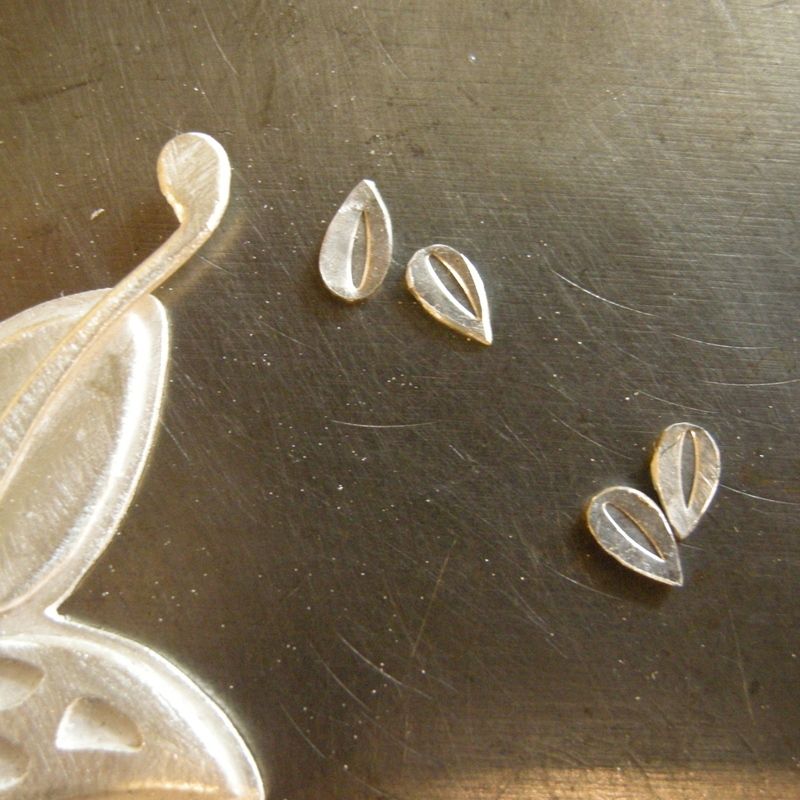 I like to buff down the edges of the stems at this point. It gives it a smoother, more natural look. You can’t really see it here but it does make a difference. Now for the fiddly bit. Cut the leaf vein things out. First snip away at the scraps until they look almost leaf like. Then hold them in a pair of old pliers and sand them down with the sanding disk on your dremel. For me this is the easiest way to do it. You might find a better way. I’ve also stamped them with a nice tear drop stamp that I bought from Larry – here. And here’s the fun part. 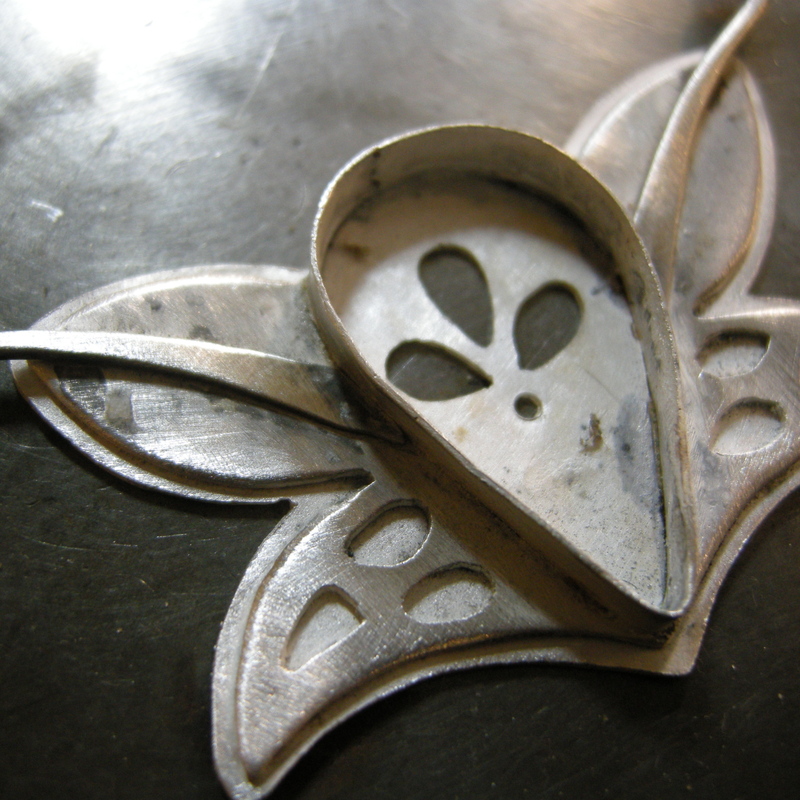 Balance alllll of those little pieces onto your design, and dare them not to solder. Now this might seem like a miracle, but I met a nice man at the gem show the other week who told me about Wolerine Ultra Flux. I bought some because after he finished telling me all about it I felt bad not to, but I’m telling you, all of those little leaves soldered first time, and as much as I would like to tell you that this was due to my remarkably fantastic soldering skills, I suspect it was the flux. It’s probably really bad for you, but now I’ve got my super duper extractor fan I’m a little happier about it getting rid of the fumes. Only a little bit though. I made it something to put the chain on. Some balls and a couple of doohickey’s. 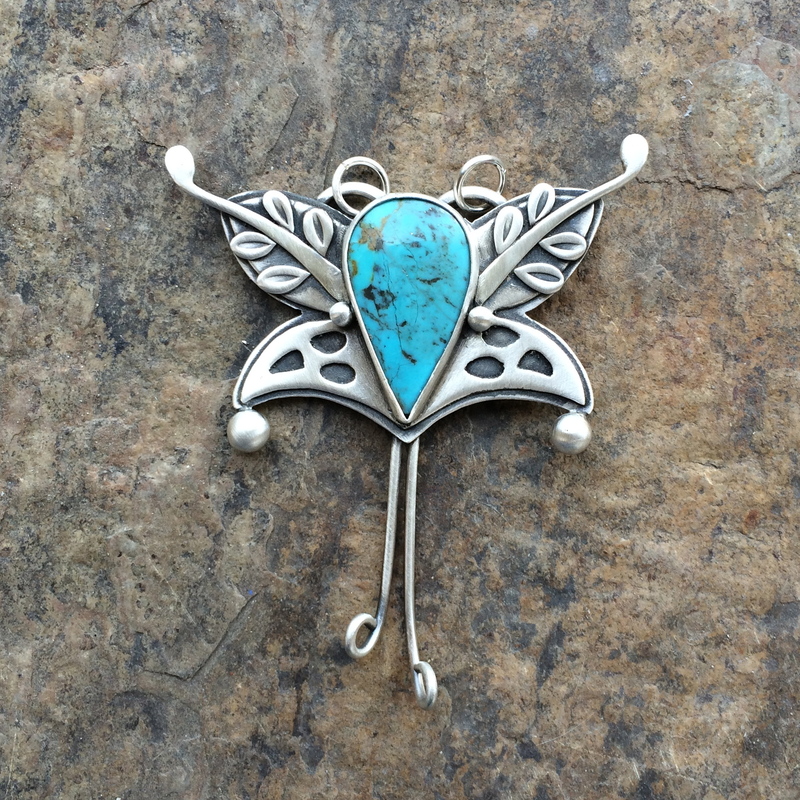 The Butterfly Turquoise Flower Thingy all liver of sulphured and polished up. So there you have it. I told you it was a long one. I would love to see if you make one. P.S. I will write up a normal, less wordy, version of this and put it up in the How To’s section of the blog later. 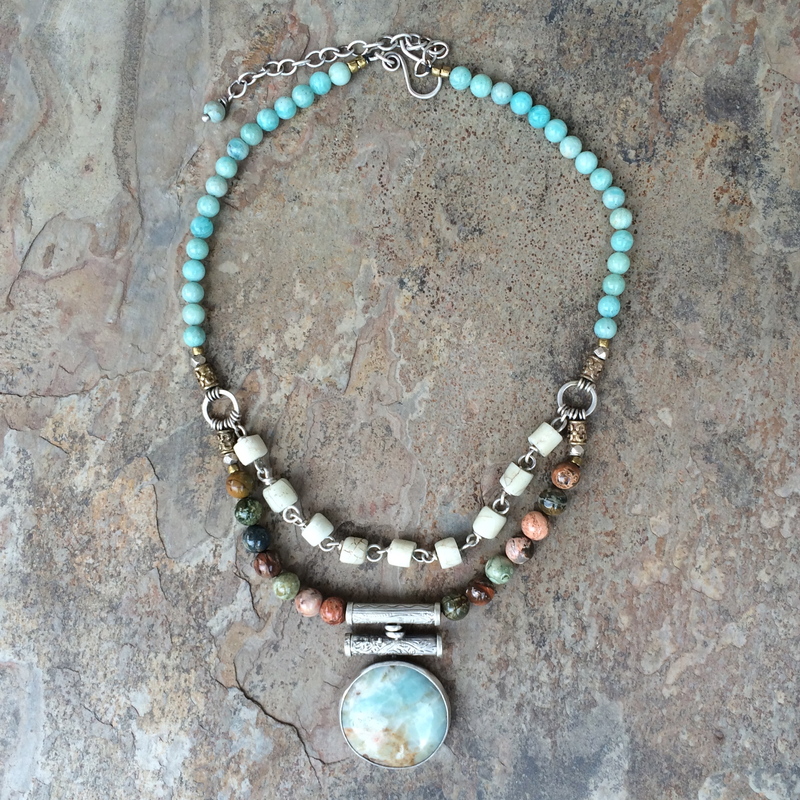 I finished the amazonite necklace. It’s a bit chunky, and I’m still not sure if I like it. Also the stone wasn’t cut perfectly round. Annoying. I also made a few paintings. And this one (below) which isn’t finished yet. It’s called, Autumn Breeze With Full Moon Shining On The Hilltop Above The Tilled Land And A Pond On A Clear Evening Just Before Bedtime. Because it’s special to have a name. My dad comes on Tuesday, so there’s probably not going to be a lot of studio time happening for three weeks. I’m in mourning already although, to be honest, I think it will give me some time to do other things and freshen myself up a little, so to speak. Maybe write, or read. Definitely sketching. Maybe photography? I’ve never really been that bothered about photography actually, and it’s a relief really to find something that I can eliminated from the, I just have to do it, list. Woodwork and glass are off that list also. I feel bad about the things that aren’t on the list. It’s like I haven’t picked them for my team. Oh gosh. Now I’m going to have to get the camera out. I’ve only got three days left. How am I going to be able to fit everything in that I just need to do before my dad comes? Like – I’ve got to touch all of my stones. Use my new oil pastels. See if I can print out some paintings. 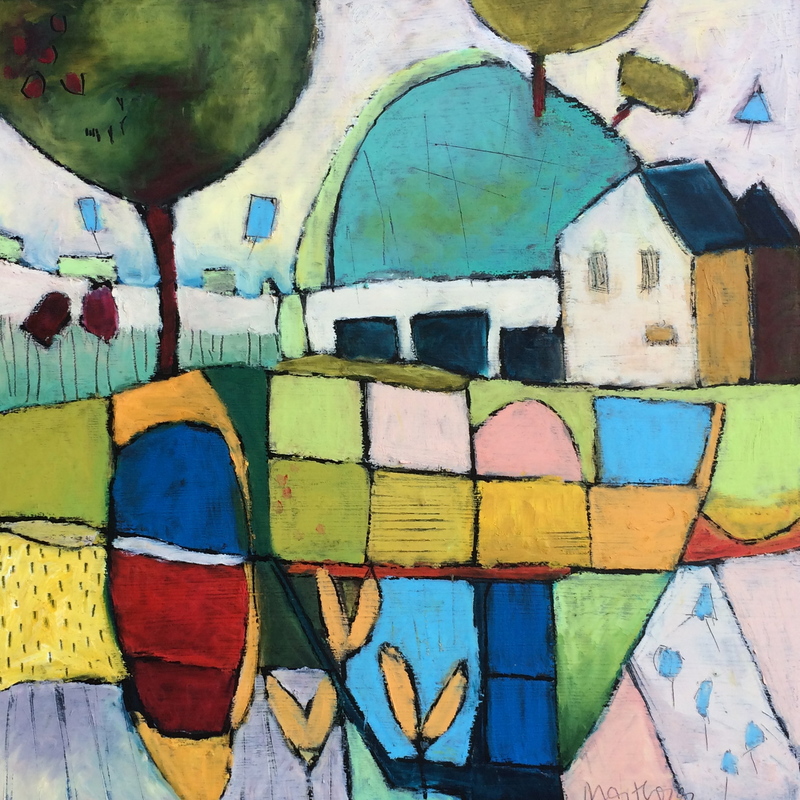 Get more touchy-feely with the encaustics. Finish glazing my pots. Get it together with some screen printing, and lino cuting. Actually, maybe I can do the lino cutting while he’s here. That’s not studio driven. I can be sociable and do that. I’m really looking forward to my dad coming :) I only get to see him once a year. I’d love to be in England where I can just pop over and take him a cake, and have a cup of tea, or walk with him over the park when he takes his dog out. So it all comes down to what is really important to me. I can give up my studio for three weeks. I think I was so excited to get out my stash and put them in their little cubbies that I forgot to photograph them for you. That’s a getting older memory block right there. Believe me when I tell you – the beads are beautiful. 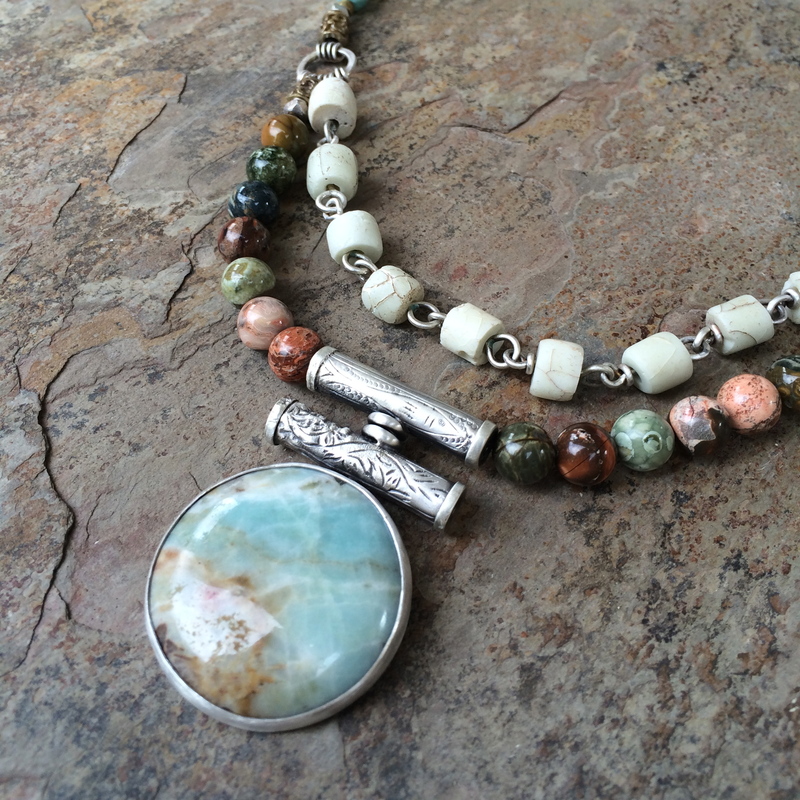 African green opals, lapis, chrysoprase, some larimar, aquamarine, turquoise, green garnets. I could go on, but then I’d have to start feeling guilty again. I did think that perhaps I should actually start using more beads in my work instead of looking at them in wonder, so yesterday I started pondering on this. Only it doesn’t use any of the beads that I bought this weekend because they’re just too beautiful to touch right now. 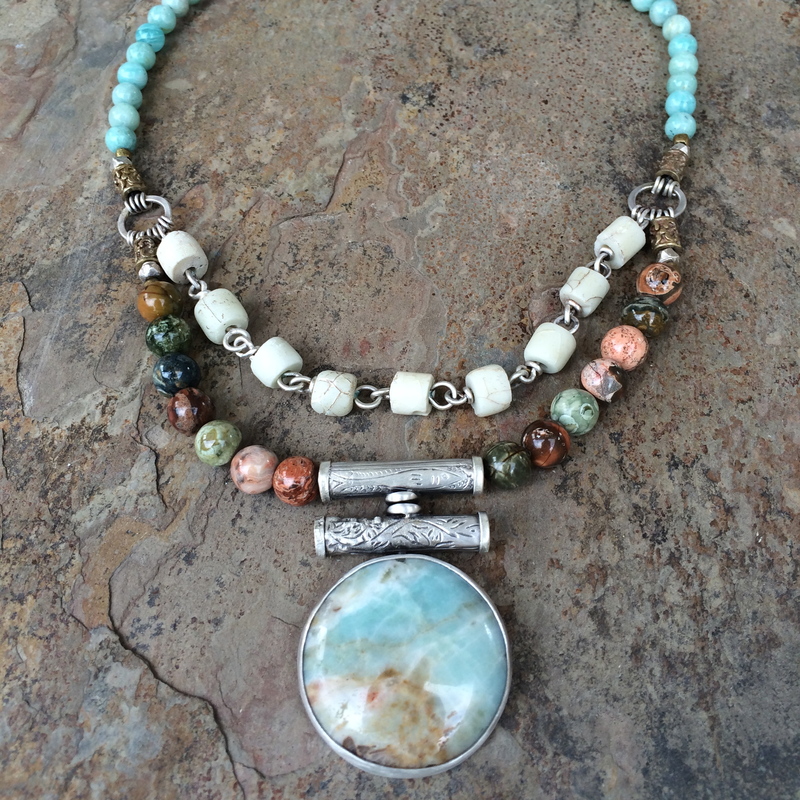 It does use a couple of the Afghan silver beads that I got from Silk Road Treasures which is one of my favourite booths at the gem show, but, I still have to see if I’m going to like it yet. That’s my lovely amazonite cabochon. I think it might well have found its forever friends. Before that I fiddled a little more with something I started on Friday. I think I shall call this set of finger paintings my angry bird period. What! Picasso had periods, why can’t I? P says that I have to go grocery shopping this morning, but I’m thinking of rebelling. The idea of putting on my clean clothes, instead of those which make me look as though my bed’s under the freeway, just doesn’t fill me with joy right now. Although I suppose it would be good to have something to eat tonight. Man. My life, I’m telling you! Good grief England, what you playing at? This was the first and last time we won. Yes, back in the good ol’ black and white days. Got to keep the dream alive. It’s not called the beautiful game for nothing. I finally finished the wonky necklace. I decided to put its danglies on after all. 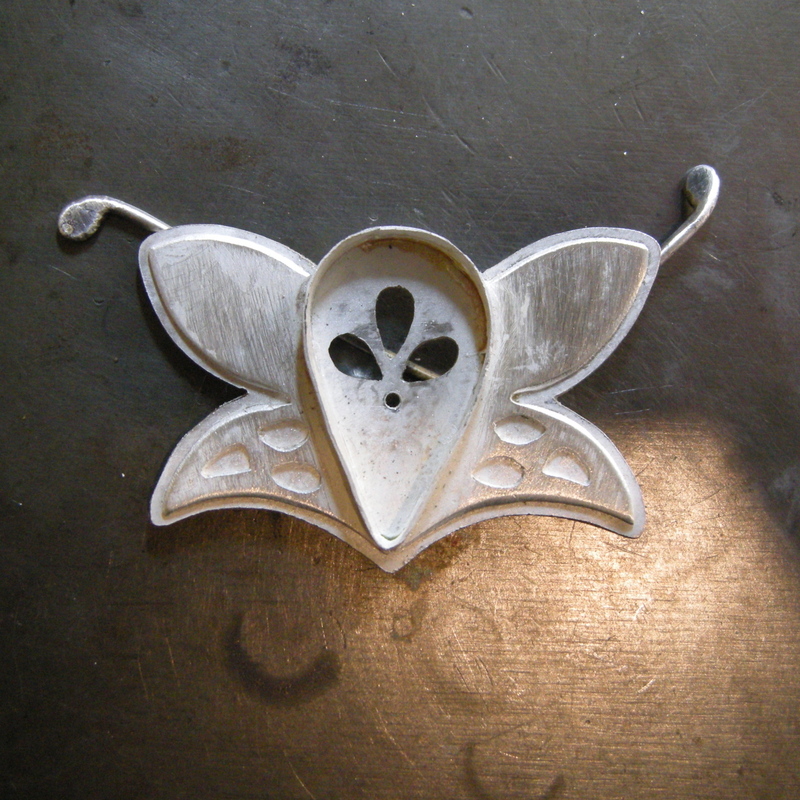 I quite like it, but I never know how long to make the chains on my pieces. It depends on the person’s neck really. I think on Etsy I’m going to just have to start asking buyers which length they prefer. I took a break from the painting to finish it up as the jewelry table was definitely calling. I’m beginning to recognize it now. I’ll be making something, and even though I’m really enjoying it, I can feel my thoughts pulling in another direction. I’ve always tried to ignore it before, and get on with what I think I should be doing, but now I’ve just decided to go with the flow. I did lay in the basic colours though, and I’m quite liking the table. I really enjoy the vibrant colours that the oil pastels give. And, I went ahead and sent my money off to Heifer. I selected the Haiti Project – here – although I’m pretty convinced that they just pool all the money and send it where needed. So I’m off now to the studio to make my next thousand. As my new friend commented yesterday, there are many starfish to save – even if you can only save them one at a time. I decided to make it a friend. Got to wait until tomorrow now. Sometimes things come at the perfect time. Now we can return to our normal programme. My latest dive into the funk left me wondering what’s it all about. I began to wonder if I should just give it all up. After all, I don’t make that much of an effort to sell my stuff, so does it really matter to me? Does the money do any good anyway, or are we all just blowing into the wind. Let me tell you, the funk has a lot to answer for. I think I will always have my doubts about where the money goes, and if it does any good, and if we will ever see a world without poverty and anguish, but I do not doubt that my life is worth more when I live generously and with conscience. And it gave me new hope. I learned that am not here to change the world, just to help a little bit. Bit of a relief really. So, today’s agenda … $1000 of jewelry sales money to Heifer International, because P says he likes them most, and a little something for the Cambodia lady, because she gives me hope. P.S. I tried looking at her bags today on their website, but keep getting redirected from their product link. I’ve e-mailed them to let them know, (yes, I know, crazy interfering Englishwoman), so hopefully we can get to see them soon. See here – Bloom Bags – but don’t forget to check back to see if they’ve fixed the problem.